The normally docile seaside resort Rosebud got an energy injection Australia Day Eve as three of Funny Guy’s finest comics rocked into town. 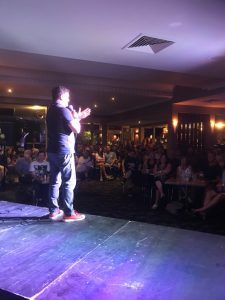 Dave O’Neil, Lehmo and Lawrence Mooney performed at the Rosebud Hotel to a packed crowd. The 200 plus audience was a mixture of locals and holiday makers, happy to have something to do other than sit on the beach in average weather. First up was Dave O’Neil who used his local knowledge to whip the crowd into a frenzy. Not only did he pay homage to the ‘Dromana caravan park’ he suggested that the carni folk who run the Rye carnival are not fully equipped to run heavy machinery. The rest of the crowd were introduced to Mark and Sandra a retired couple, Scott the young Dad who was hanging out with his parents on a Thursday night and couple Michael and Maria who were trying to hide from their teenage children. Dave O’Neil told us all about the good old days, when you had to ring a girls house to ask her out (instead of swiping left) and go to the chemist to get your photos developed. Next up was Lehmo, as seen on The Project and Utopia, who woohed the crowd with his tails of having a baby and coping with being a new Dad. He charmed the crowd with his sheer likeability and every man in the room nodded their head when he talked about his wife having too many cushions. Asthe night had its interval every bloke tried to go and have a beer with Lehmo every man’s best mate. Lawrence Mooney was last on and did a blistering set starting off with his frightening Bayswater child hood, his scary elderly mother, his troublesome teenage daughter and ended on a story on how he gave birth once (you had to be there!) Despite the Moon man being high on Codral and free beer, host Dave O’Neil wouldn’t let him leave the stage. The crowd demanded to hear his Malcolm Turnbull imitation and the yes the Prime Minister himself turned up and told everyone about Barnaby Joyce’s beetroot head and his hatred for Greenies ‘Have a wash once in a while.’ The crowd rose to their feet, flowers were thrown and many selfies with the comedy stars were taken. The night was over but the Rosebud Hotel will never be the same. 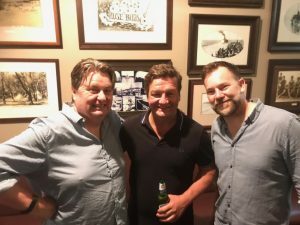 Dave, Lehmo and Lawrence were last seem in the gaming room where Dave was taking full advantage of the free biscuits, Lehmo was putting all of his cash into a pokie machine and Lawrence was chatting up an 86 year old called Toni. Still to be confirmed whether Toni is male or female. If anyone in the Rosebud area spots Dave, Lehmo or Lawrence please contact Police as they have not made it home yet. Why should Rosebud have all the fun? If you’d like your very own comedy night with Australia’s funniest comedians, shoot us through your details and we’ll be in touch. Whether its a high end corporate event or just a family get together, be it in Melbourne or Muckatah, Funny Guys can help out with Australia’s best comedians. The stars of the Funny Guys show at the Rosebud Hotel. Dave O’Neil, Lawrence Mooney and Lehmo. Lawrence Mooney beckoning the crowd to literally eat out of the palm of his hand. Which they duly did.